This is the bang bang of comfort food. 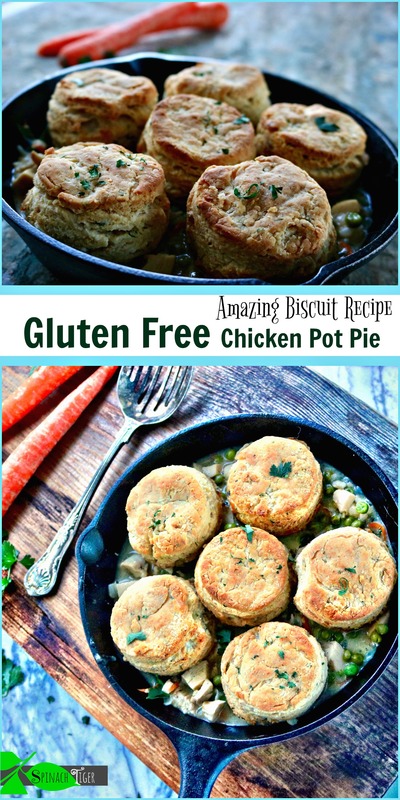 And, it’s gluten free, although no one will really know that it’s not simple old fashioned chicken pot pie with biscuits, just like grandma used to make. If you’re new here, just know that this is about the 20th biscuit recipe here at Spinach Tiger. It all happened quite by accident, as I didn’t grow up eating biscuits. I think I ate my first biscuit when I was 24 years old and it came from a fast food place. Of course, I fell in love with them, because biscuits speak to the soul, even if they’re not a childhood memory. Eventually, I married a man from the south and moved to Nashville. Just for fun, and for him, I attempted to make biscuits like this grandmother made. These biscuits to him would be like my grandmother’s tomato sauce to me. One thing led to another and after throwing many biscuits out, I cracked the code. Google seemed to know that and so far has sent over 329,000 people to that fluffy biscuit recipe. The funny thing is they send just a little more than that to my grandmother’s tomato sauce recipe, making both of these the all time number 2 and 3 recipes out of nearly 900. For the longest time I’ve been wanting to make some kind of chicken biscuit recipe and I saw Preppy Kitchen do that on Instagram. I thought, I’ll do the same thing only gluten free. One day I realized many people were looking for a gluten free biscuit. I put the same trial and error hard work into the recipe and cracked that code. Now the gluten free biscuit recipe beats out the regular one! If you haven’t made my gluten free biscuits before, you’re in for a treat. They are super good, and there’s a video to show you how to get it right, at the top of of this page. The only crazy thing that happened today is I found an even better way to make my gluten free biscuit, using some golden flax. When they came out of the oven, I bit right into one, to find out my idea worked even better than I thought. I immediately rushed over that very popular recipe to let people know this new discovery. Golden flax also known as linseed, comes from the flax plant , which is cultivated for its seeds as well as its fiber and contains Omega 3 fatty acids. It adds flavor and texture to grain free and gluten free baking. The chicken can be left over, or you can sauté cubed boneless chicken breast. I tend to like roasting chickens and using leftovers. It’s money saving and kitchen sensible. You can play around with the veggies. I kept it on the simple side with peas, carrots and onion. Not wanting to use flour for thickener, I used unflavored gelatin in broth (similar to what I did in this chicken marsala recipe). You can use a corn starch slurry if you want to. It’s great if you have your own homemade chicken broth, but you can use store bought. Make sure to use a low sodium. I added in a little dijon mustard to boost flavor and a good deal of parsley. I think some other herbs like dill or tarragon would be great too. When I made the biscuits, I added in some dried herbs and fresh parsley to the flour. You will get 8 biscuits which is more than enough for this recipe, and give each serving two biscuits. I baked the biscuits separately and then placed them on top of the chicken, as I like crispy bottoms. Some like to put raw biscuits on the creamed chicken and then bake the biscuits, but you risk some sogginess. You can make each component ahead of time and then place biscuits on top and reheat in oven. If you do this, just don’t bake biscuits to the full golden brown. Leave room for a few extra minutes. I hope you enjoy this yummy Southern comfort food. It’s a little richer than my normal middle of the week dinner, but sometimes life calls for the most comforting of food. 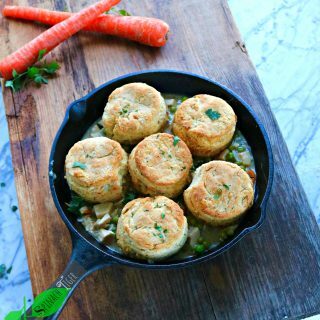 Nothing says comfort more than chicken pot pie with biscuits. 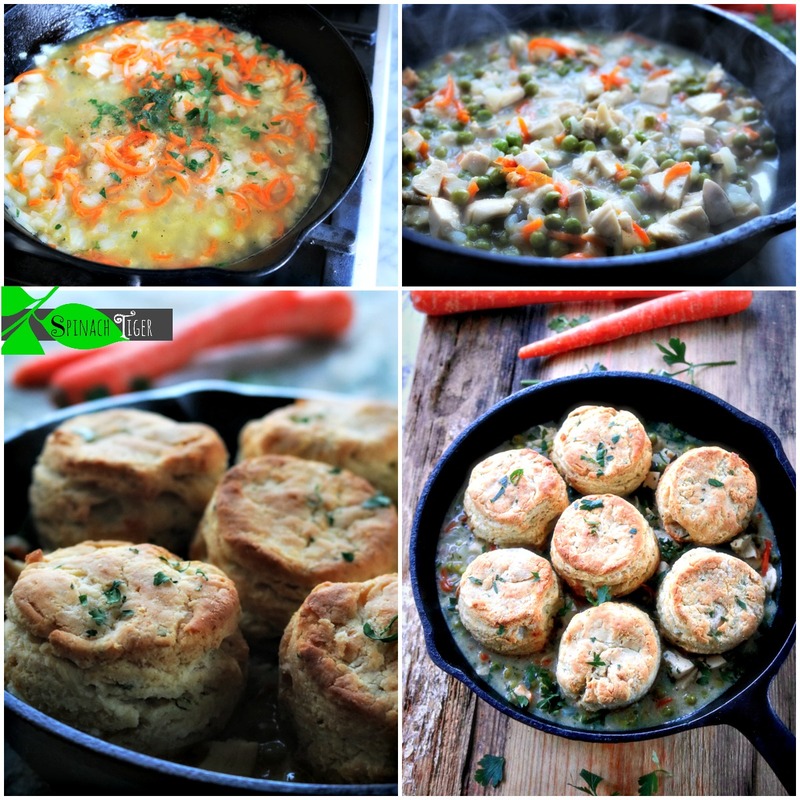 Creamy chicken with vegetables and gluten free southern fluffy biscuits on top. Melt 2 tablespoons butter in frying pan. Add diced onion, celery, diced carrots. You can shred carrots as I did if you desire. Once onion, celery and carrots are softened, add broth. Add in a tablespoon of dijon mustard. Stir to incorporate. Add in a few tablespoons white wine or dry vermouth. Cook on lowfor about fifteen minutes. As the broth is cooking down, make the biscuits. Add in chicken and peas. Add 3 tablespoons minced parsley. Reserve some for final garnish. 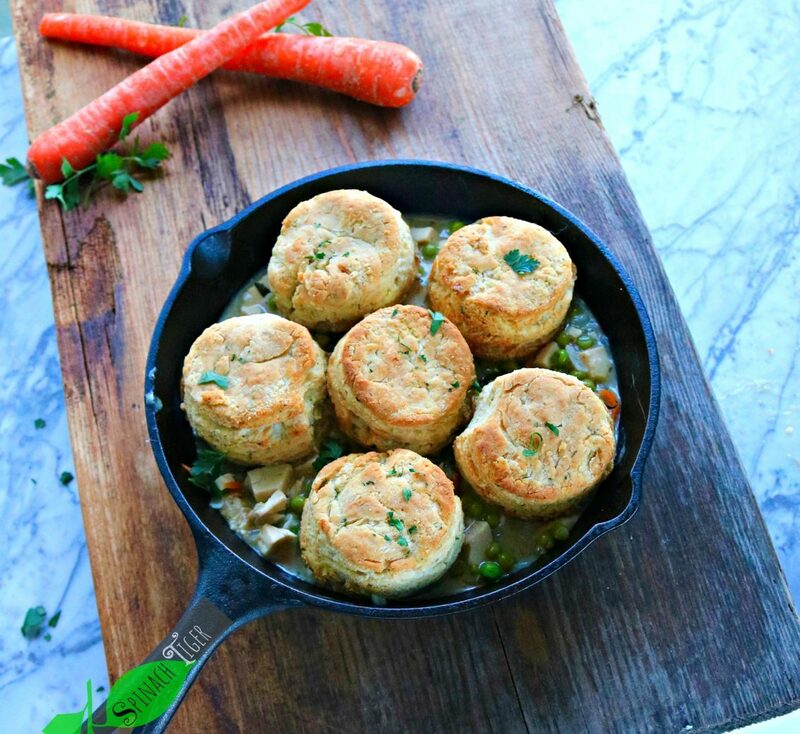 Once the chicken mixture is creamy enough, add golden baked biscuits to top serve. Chicken: You can use left over chicken, chicken from a store bought pre-cooked chicken. If you are using raw, boneless chicken breasts, cut into small bite sized pieced, stir fry in butter or oil of choice until done. Remove chicken. Set aside. In same pan, start recipe, by adding butter, vegetables. Thickening the sauce: You can either use a corn starch slurry to keep the recipe gluten free or use an unflavored gelatin which you add to the chicken broth. Biscuit recipe is here. As an option, Add in freshly chopped herbs to the flour before adding butter. I followed your instructions (and thanks so much for the email regarding it) to the letter, and I am so very pleased to finally have mastered the ‘art’ of scooping out eggplant from it’s little cute shell! I had to tell you about our anniversary dinner last night – absolutely fabulous, and my husband loved it! I am absolutely amazed at how you’ve perfected those gluten free biscuits! They’re absolutely PERFECT! Wow! I watched the video, Angela. Beautiful production, kitchen, dishes, music. The effort you are putting into your business is so evident. Very impressive. Beautiful photographs. Something happened and my link got entered with extra punctuation.